Investigating the environmental effects of Reverse Electrodialysis power generation (Blue Energy) on the environment and impact of clogging, fouling etc by organisms in the REDstack experimental power plant in the Netherlands. Development, maintenance and improvement of the VISwijzer website en iOS en Android apps. Performing sustainability assessments for fisheries and aquaculture products for Good Fish Foundation and different clients. During my PhD I studied the occurrence, species composition, seasonal patterns and long-term changes in populations of gelatinous zooplankton in Dutch coastal waters. Focused on changes following the introduction of the invasive ctenophore Mnemiopsis leidyi. First I qualified and quantified the role gelatinous zooplankton plays in the ecosystems of Dutch coastal waters, primarily the Wadden Sea. The invasive ctenophore Mnemiopsis leidyi was found to be the most abundant species present in the area. Using field sampling, experiments and Dynamic Energy Budget modelling I investigated what makes this species such a successful invader. Promotor: Prof. Dr. Theunis Piersma, University of Groningen. Co-promotores: Dr. Ir. Henk van der Veer, NIOZ en Dr. Victor Langenberg, Deltares. 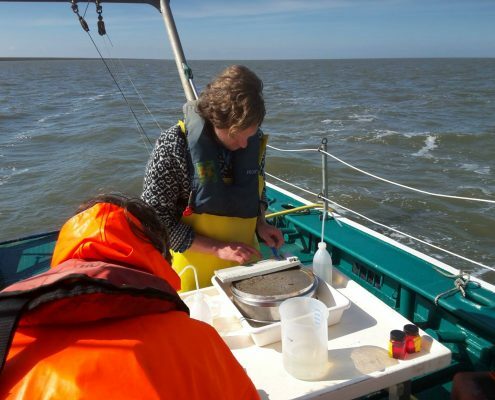 Investigating the species composition and seasonal patterns of gelatinous zooplankton in the Wadden Sea by means of a weekly sampling programme. I also participated in 6 week-long sampling cruises for the NIOZ NWO-ZKO project “Structure and trophic functioning of Wadden Sea fish fauna”. Supervisor: Dr. Ir. Henk van der Veer. Assisting Project Seahorse researchers with SCUBA diving fieldwork investigating distribution and ecology of seahorses. Underwater transects, measuring and tagging seahorses in the Ria Formosa nature reserve in southern Portugal. Performing a study on fisheries induced evolution in North Sea plaice, more specifically on sexual dimorphism in reproduction and growth. For this project I sampled discards and bycatch of North Sea beam trawlers and joined several ICES IBTS and BTS surveys on the North Sea. I presented the results at the International Flatfish Symposium in Sesimbra, Portugal in 2008. The study is published in Journal of Sea Research. Supervisor: Prof. Dr. Adriaan Rijnsdorp. 2010–2016: PhD. Marine Ecology, University of Groningen, Groningen, Netherlands. On occurrence, species composition, seasonal patterns and long-term changes in populations of gelatinous zooplankton in Dutch coastal waters. Focused on changes following the introduction of the invasive ctenophore Mnemiopsis leidyi. 2007–2010 MSc. Marine Biology, University of Groningen, Groningen, Netherlands. MSc thesis on match-mismatch processes in de Wadden Sea. 2004–2007 BSc. Biology, University of Groningen, Groningen, Netherlands. I have made about 500 SCUBA dives, mainly in Dutch waters (inshore, North Sea, Wadden Sea, Zeeland) as well as in areas such as Cornwall, Brittany, Mediterranean, Red Sea, Caribbean. participated and (co) organised 100+ weekend- and summer camps as nature guide in the areas of sea life, birds, butterflies and dragonflies, as well as various other functions such as overall supervisor, treasurer and cook. Organising introductory courses in marine biology for SCUBA divers and dive clubs. Lectures, dives and practicals on identification. A local diving club. Organising camps, teaching theory and practice of diving. Functions including Board Member, Instructor and Course Leader.